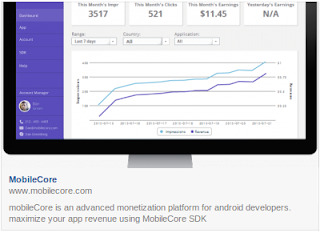 Get extra money from your Android / iOS apps. They support ad-wall displayed on app exit. Slider pane on the left which provides decent menu framework, has ads on it. which make your app conform to recent updated trend of apps. 안드로이드 / IOS 애플리케이션에서 추가의 수익을 벌 수 있습니다. 모바일코어는 어플 종료에 표시되는 광고를 지원합니다. 어플의 최신 디자인 추세를 쉽게 구현할 수 있습니다.